Readers know that I’m not a big fan of pants. My main complaint is sizing. If they fit my thighs and calves, they’re enormous at the waist. See Finding clothes to fit athletic women’s bodies. But also if I gain or lose even as little as 5 lbs, they don’t fit. So I end up with a range of sizes to cover a very small range of difference in weight. And don’t get me going on the leg length thing. I usually have to hem pants which adds $10 or so to their price. Men’s pants seem to come in a variety of lengths but women, I guess, are all the same height. Also don’t get my going on jeans, especially skinny jeans, which they all are on me. Aside from my yoga jeans, I might be done with jeans. Last year I went on a leggings binge, trying lots of different kinds to find the perfect pair of plain black leggings for everyday use. I tried the full gamut from Lululemon (on sale!) to Hue to Joe Fresh. The price range was $90 (Lululemon, on sale) to $20 (Joe Fresh). The Lululemon are fine for yoga but too athletic for everyday. I’m not a big fan, especially given the price. The Joe Fresh were fine for PJs and hanging about the house but not really for work. In the middle were the Hue leggings which I had great hopes for since I like their tights. But it wasn’t to be. They share the pants problem. The large isn’t stretchy enough for my legs. The XL falls down pretty much right away. When friends who play roller derby recommended a Canadian brand I was intrigued. They’re also middle of the road price wise. And made in Canada. Nice. I’m trying not buy stuff made in countries with sketchy labour laws. See this post for my call for ethical fashion. I struggle with sports clothes in particular. Even without the “made in Canada” bonus point, they were my favourite. I’m setting out now to order more. They are high waisted, they stay up, and they work for either the gym or the office. Why I am blogging about leggings now? My knee brace, above. That’s my snazzy custom fit, zero pain knee brace. But it’s causing a bit of a fashion crisis. It needs to be tight against my legs. 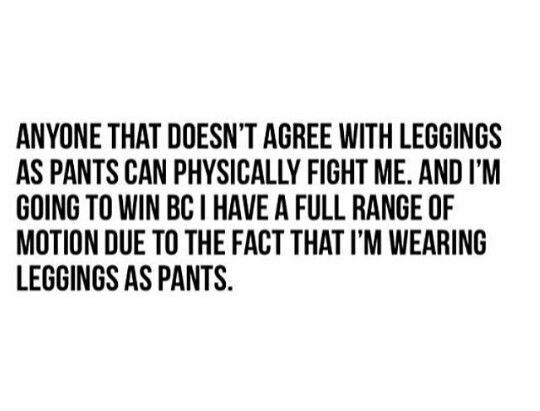 I can either wear skirts and tights or leggings. No pants. Well, I could wear really wide leg pants and wear it under I guess. That’s what men do. But that’s not my thing. So now I’m one of those people wearing leggings for all of the things. Until summer (if it ever comes) and then I’m back to bike shorts under skirts. Next Post Would you run a 10K with no prep? My knee brace also caused me to embrace leggings. I don’t like wearing the brace without something between me and it. I had a leg sleeve that I could wear when it’s warmer out. But then it made it look like I’m wearing leggings on just 1 leg under my skirt. So I guess I’m “fortunate” enough that the OA is now bad enough in the other knee that I have to wear a brace on that one too. I’ve been learning to sew so that I can make leggings and pants that actually fit. Yeah. I’m worried about summer and the leg sleeve! Learning to sew seems like a brilliant idea. I have huge calves too. I hate pants. Lulu align. They take me everywhere. Wearing comfortable fitness suits will help you focus on daily workout and exercises. I’d like to share to you the kind of suits I mostly wear https://fitnessgrab.com/collections/yoga-clothes. And ofcourse an excellent method of getting in good shape is selecting exercise routines that firm up your body’s muscles and improve their flexibility.